Join the prayer of the Congregation delegates. This is the text of the morning prayer for September 29, 2016. 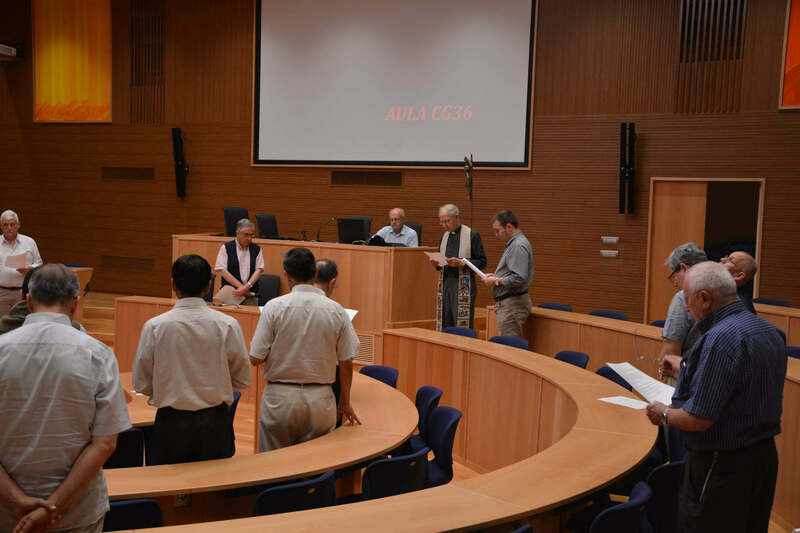 On September 22nd, a few days before the beginning of the GC, Father General, in the presence of a large number of the General Curia team, blessed this beautifully renovated room where the members of the General Congregation will meet from October 2nd. Here is the prayer that has been prepared and was used for the occasion. Peace to this hall and to those who will gather here. The Lord Jesus, who has set up his tent in our midst, dwells with us, nourishing our fraternal solidarity and sharing our labor. It was decided that Paul and Barnabas…should go up to Jerusalem to the apostles and presbyters…The apostles and presbyters convened…a great discussion arose…Peter got up and said to them…Brothers,…we believe that through the grace of the Lord Jesus we are saved…. The whole assembly became quiet…(Then) it seemed good to the apostles and the presbyters, with the whole Church, to select some of their number and to send them to Antioch…with this letter…: It has seemed good, to the Holy Spirit and to us, not to impose an other obligation beyond these necessary things…. At Antioch, when it had been read, they rejoiced in the encouragement which it inspired. The Word of God We give thanks to God.  Remain with us, Lord. ◦ Word of God, who has willed to dwell among us, come to fill this our place of work with your presence and your light. ◦ Christ risen, who has promised to remain in the midst of your faithful ones reunited in your name, give to us to know how to form a single family of apostles in your love. ◦ Servant obedient to the Father, who has come to serve and not yourself to be served, be welcome between these walls, where our General Congregation will strive to discover your will. ◦ Jesus, whose name the Company bears, send your Spirit so that all of us know how to discern the call which today again returns to us, in this epoch of history. Saints Peter and Paul, – pray for us. Saint Ignatius and all you saints and blesseds of the Company – pray for us. the cornerstone who unites us in your charity. – Amen.